Thru the years FAFS Corp has developed a reputation of providing quality services to its clients and partners. These quality standards are managed and directed by our highly trained department of quality monitors, evaluators and auditors. Our core business has always been providing secure quality services thru loans and financial institutions. These same high quality standards have been carried thru the company as additional outsourced services have been supplied. Quality monitoring allows us to observe an agent’s phone calls, emails and web chats and evaluate these against our pre-defined quality standards. 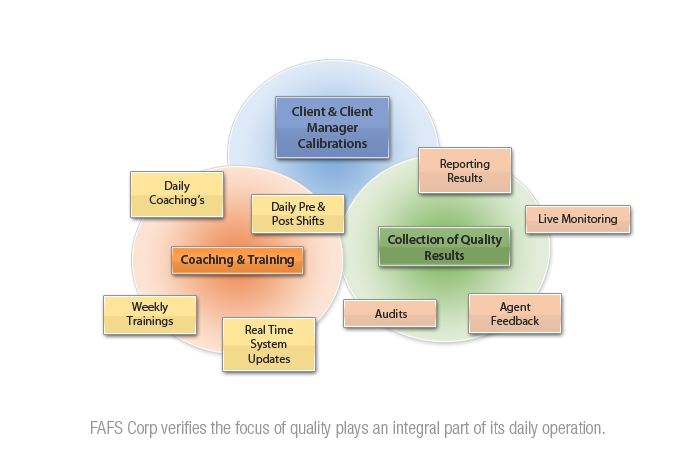 The lifecycle begins during hiring and training, when a prospective agent’s performance is monitored and evaluated to identify weaknesses and skills gap. After training is successfully completed, the agent begins handling customer interactions and is monitored regurarly to identify issues and performance gaps. Distinguish between deficient agent performance and deficiencies in the elements being evaluated or in the service process.. Evaluate agent performance against established standards and for any performance that merits action, note record and refer to the responsible component (HR, QA, Training, etc.). Ensure the agent gets both positive and negative feedback to improve their performance. Provide on going training and coaching. repeat this process continuously throughtout the agent’s tenure.. Process and system improvement issues, as well as needed training curriculum revisions, are often identified through monitoring sessions. These issues are fed back to the responsible component for action..
FAFS Corp understands that importance of quality monitoring and the affects it plays on all aspects of operation, from hiring and training agents, to honouring superior agent skills and ultimately discovering and correcting problematic areas. A qualified monitoring team identifies performance deficiencies so that corrective actions can be taken in a timely manner. Our QE department takes pride in offering the most up to date quality feedback available. Each skilled Evaluator is trained to pay attention to the detail of the call and grade each area of the call. There are 9 Areas and 37 points of each call that are evaluated and graded. The critical areas cover all potions of the call from the intro to the data collection to the performance and resolution. By giving each agent a grading target we can improve the overall experience for your customers. We can create better long term relationships which can increase customer retention. And we can reduce hold times and verify smoother and better processes of transfers and transactions. Daily the FAFS Corp QE team supplies detailed reporting and feedback to the managers and client managers. All calls and results are evaluated thru our interactive dashboard platform which allows all data to be saved and corrective actions and coaching’s to be documented. Using this interactive proprietary platform allows us to provide customized reports showing flags in calls, coaching sessions and grades real-time from our QE department. This information can be readily available for all managers and clients as needed. Live monitoring is a key ingredient in offering superior customer service and sales quality. A team of Live Monitors listen to calls live for training and coaching reasons. When it comes to reputation of a company’s brand, we understand that the integrity of a sale is just as important as a non-sale. Our dedicated Team of Live Monitors listen to all calls inbound and outbound. This way we can verify your name and reputation is being held to the highest standards. We also have set up live monitors for our chat support. This allows us to monitor the agents performance levels and do take over’s as needed. When it comes to chat support response time is critical, live monitoring helps us know and keep our standards to the highest mark. The FAFS Corp. Audit Team specializes in Auditing crm and fulfilment transactions along with reporting and special cliental projects. This team is trained to pay attention to the details. They verify that all steps required for each transaction is handled correctly. No detail is too small when it comes to standards of support. All audit results are calculated into the agents overall score card. These score cards combine the agent’s quality level of performance. This allows our team of dedicated trainers and coaches know what areas need to be covered based on that agents overall score and reasons.